Violet Elsie Barker is pictured on the right. The young man is probably her fiancé, Frank Peebles. Frank was enrolled in the Middlesex Regiment (also known as the Duke of Cambridge’s Own) and was killed in action in France and Flanders on 23 October 1918. Violet didn’t receive the news of his death until after the Armistice was declared. 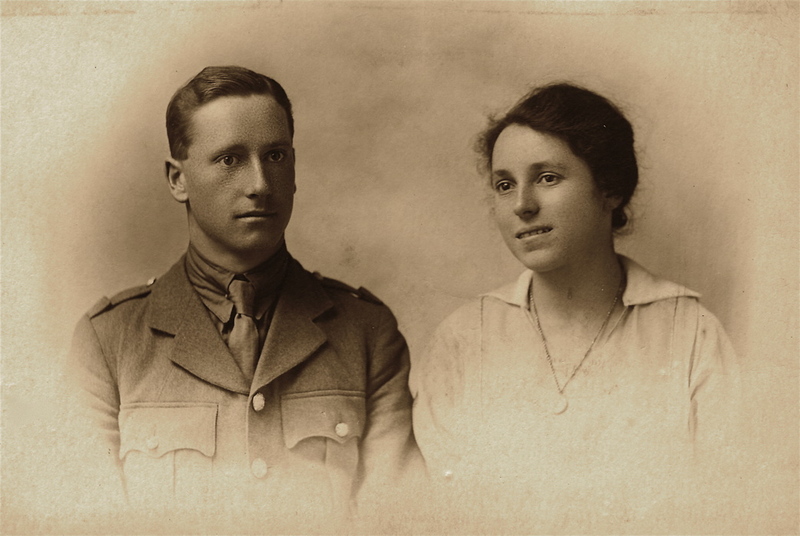 Frank was a Lance Corporal, his full name is given as Ernest Frank Peebles and his service number was 33272. He is buried in the Montay-Neuvilly Road Cemetery, Montay, France (Grave/Memorial reference II.D.6). His details are available at the Commonwealth War Graves website, along with a link to information about the cemetery.